The Passing of Jonathan P "Jack" Jones. Jonathan P. "Jack" Jones, 86, of Honey Brook, passed away at the Brandywine Hospital on Monday, January 8th, 2018. He was the widower of Mary Baker Jones, who died in 2008. Born in Honey Brook, he was the son of the late Olive (Elmer) and Paul Jones. An area resident of Honey Brook his entire life, he was a 1949 graduate of Scott High School. Jack was a career firefighter with Washington Hose Co. #1 beginning in January of 1966, and in July of 1989 he left the Washington Hose Co. and changed over to the City of Coatesville Borough of Fire, and in 1993, after four and a half years with the City of Coatesville, he retired. After retirement, he worked for Whites and Weaver Memorials as a salesman, and also as a limo driver for Royal Limo. 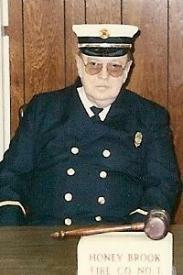 He was Past Chief, President and Lifetime member of Honey Brook Fire Co. #1. He was a member of Beaver Creek Historical Fire Co.. Jack taught at Chester Co. Fire School, and was involved in the establishment of the Chester Co. Emergency Services Radio System. He had a particular fondness for Pontiac and Jaguar automobiles. He was survived by three children: Elizabeth "Betsy" Cahoe of Coatesville, Lisa Harden, wife of Chris, of Port Saint Lucie, Florida, and Edwin Jones of West Chester; five grandchildren; and seven great-grandchildren. He was predeceased by his daughter, Susanna Clapsadle in 2015. The Memorial Service will be held on Saturday, January 27th, 2018 at 12 noon at the Honey Brook Fire Co. #1, 679 Firehouse Ln, Honey Brook, PA 19344 with visitation from 11 AM to noon. Luncheon will follow the service. In lieu of flowers, donations may be made to the Honey Brook Fire Co.